We are excited to announce our newest integration with AdClarity. They provide display advertising competitive intelligence. In Follow you’ll now see several new AdClarity reports under our display advertising overview tab. As with all of our 3rd party integrations, we only show some of their high-level top datasets. If you want all of their data, you’ll need to sign up with them directly. 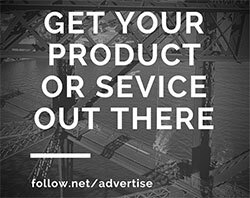 You can sign up for AdClarity by visiting their website. Why are we adding another display advertising data partner when we have three already? Every company providing competitive advertising data tries their best to get the most accurate data possible. But because no one gets it directly from the ad networks, no one has 100% accurate data. No vendor can tell you exactly how much a website is spending to advertise online, or show you with 100% accuracy every ad they are currently running online. They don’t have to be 100% accurate though. They just have to give you a good enough understanding of a competitor’s campaign to make use of it. We show you data from multiple different partners because each of them offer a different view of how your competitors are advertising. We believe you’ll get a better view of your competitor’s marketing campaigns when viewing their information from several sources. This also gives you a chance to preview all of their data before you decide to sign up for any of them. 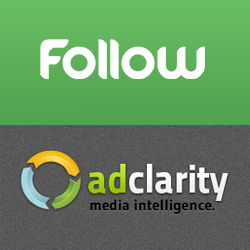 We hope you’ll enjoy our newest integration partner, AdClarity. We’re excited to join them with the rest of our other great data partners. Without further ado, here’s what our new integration with AdClarity has to offer! See the number of impression, mediators, unique publishers, campaigns, text ads and image/flash creatives the website has. 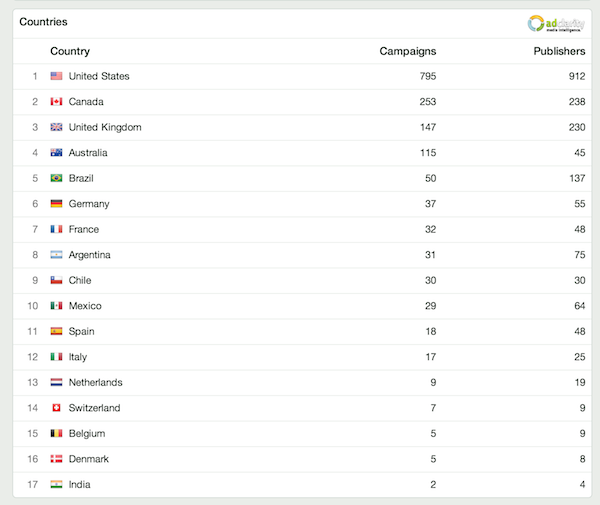 See the top countries they are advertising in, the number of campaigns and publisher sites they are advertising on. See the advertisers top mediators. A mediator is an entity that is involved in the deployment of a campaign, but is not the advertiser or the publisher. Mediators can be ad networks, affiliate networks, agencies, exchanges, and any other “middlemen” involved with a campaign. 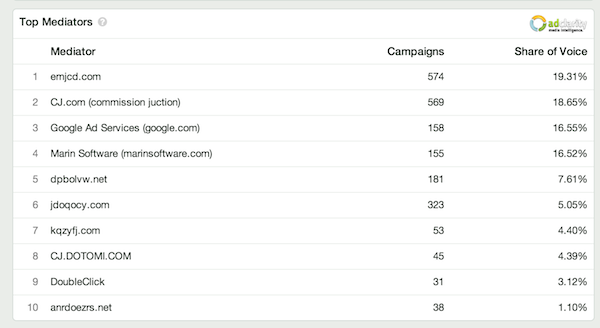 See the advertisers top US targeted site placements. 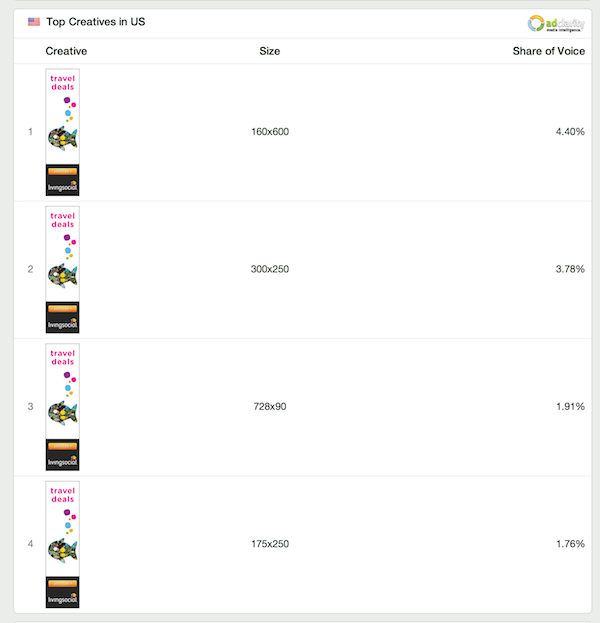 See the advertisers top US targeted flash & image creatives. What does AdClarity’s share of voice mean? You’ll see this included in a lot of their datasets. The statistical share, or share of voice, is the part of the total advertising space available occupied by the given entity. For example, when looking at a specific advertiser, you can see the list of campaigns run by that advertiser and their statistical share. A statistical share of 58% for a given campaign means that of all the times AdClarity has come across this advertiser, 58% of the occurrences were of this particular campaign. Want more data from AdClarity? Sign up for AdClarity. This entry was posted in New Features, New Integrations on April 14, 2014 by Wes Mahler.